The Conlon Project series continues with Part 4, a collection of five stories based on cards selected by our writers. We continue to present different writers and different stories. This week’s installment includes stories on Conlon figures: Pie Traynor by Scott Chamberlain; Bennie Tate by Tim Jenkins; Dizzy Dean by Tom Shrimplin; Earl Webb by Tony Lehman; and John “Chief” Meyers by Anthony Salazar. As a Pittsburgh Pirates fan, my attention turns to players in a Pirates uniform first. But the Pie Traynor card in my pack grabbed my attention for more than just that. I selected his card because of the expression on his face. Charles Conlon captured Pie talking with a big smile on his face. That expression on his face seems to be saying, “I love being in a Pirates uniform and being part of this team!” Pie’s smile on this card is one that makes me feel good every time I look at it. I sure wish I knew what he was saying when the photograph was taken. Even though there were several well-known players in my pack, I was drawn toward a “common” player’s card: journeymen catcher, Bennie Tate. The anonymity of “scrub” players leads one to flip the card over to answer the question: Who is this guy? Bennie’s biographical information on the back confirms his modest credentials by insinuating that his most significant “accomplishment” was calling the pitch that Babe Ruth hit for his 60th home run in ‘27. Tate’s lack of notoriety aside, the photo is a classic Conlon portrait in that it reveals much about the person. In an era where players often appeared older than their ages in photos, Bennie looks like a 25-year-old. His demeanor is serious but not stern. He seems pleased that Conlon is photographing a career back-up. In addition, the image captures the feel of the early 20th century. The high-collard, Senators uniform along with the WW1 memorial patch evokes the era. Also, Tate wears the low-crowned, cap style of the period. If the photo were in color, the cap would be white with a navy “W” and a red bill. The clarity and evocative nature of Conlon’s work transcends baseball. My wife was intrigued by Conlon’s stunning photos and collected all the series in the 90s. Once, I visited a 6th grade classroom to show part of my memorabilia collection. I gave the students Conlon doubles. The kids were intrigued, as was their non-sports fan teacher. A testament to Conlon’s lasting artistry. As I opened the package of Conlon baseball cards, one after another were names I remembered hearing about, until I got to the next to the last one in the stack. Dizzy Dean is one of the first memories I have of baseball. In the 50’s he was on the GAME OF THE WEEK, on TV in black and white, describing the action on the field and telling us stories of his time on the field. Ol’ Diz was as entertaining as any comedian, now or then. And as a 6-year-old, his strange twang and dialect was something I had never heard. At first, it was hard to understand, but after a few weeks, it was as familiar as Howdy Doody. Only after I grew older and started to learn about baseball in the 20’s, 30’s, and 40’s did I find out what a great pitcher he was. He definitely deserves to be in the Hall of Fame, and it makes me sad I wasn’t able to see him pitch. With an ERA ranging from 2.66 to 3.30 between 1932 and 1937, and a winning percentage of 0.644, I agree that he was one of the all-time best pitchers. Only in baseball will you find a “character” like Dizzy Dean. That’s what make the game unlike any other. Card #261 features Earl Webb – still the leader for most doubles in a season with 67. 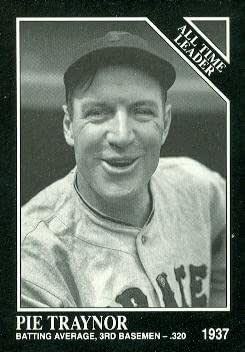 As the card informs us, Webb set this record in 1931 at the age of 32. Webb has always been something of a blank slate in my head, with thoughts of him colored by an old Topps cartoon on the back of a 1977 card. This portrait of Webb that Conlon captured, however, shows more. An unsmiling Webb stares out from the dugout, looking directly at the camera. His uniform is buttoned all the way to his neck and adds to the seriousness of the photo. Webb almost looks crestfallen at the fact that it took him until his thirties to make an impact in the major leagues. It’s a solemn photo, befitting the seriousness of the Great Depression era. I chose this photo of Webb in part because of the solemnity – something about the look in his eyes feels like it is telling a story of a fight to get to the major leagues and, then, a fight to stay there. The other part: the photo is the first time I have ever seen Earl Webb as a person rather than being a cartoon character on the back of a baseball card. Over the course of the Conlon Collection Project, I’ve looked over all the cards in this 1991 330-card set, the Chief Meyers card is one of the few that features a catcher. Ray Schalk (#48) and Tony Lizzeri (#113), being the others. The bulk of the set portray awesome player head shots, or pitchers and batters in action, but this Meyers card stuck me with great interest. I usually don’t think too much about catchers (my apologies to those of you who do), but when looking at Meyers’ card, I thought about his era, the 1910s, the types of players he had to face and the equipment he used. Meyers played the bulk of his nine-year career with the New York Giants, with a couple of season with the Brooklyn Robins. He’s listed as being 5’11” and 194 lbs. Not the most bulky of catchers, but he sounds pretty athletic. The photo depicts Meyers presumably before the game taking some warm-up tosses. He’s wearing his shin guards and a chest protector, sporting his pillowy catcher’s mitt with his facemask is in front of him on the ground. Again, not being an avid aficionado of the catcher, I was intrigued enough to do a bit of research on the evolution of the catcher’s gear, particularly of his mask. The version that Meyers seems to have was developed in 1910, called the “Wide Sight” or “Open Vision,” which gave catchers a better peripheral vision of the action. I’m appreciative of the Conlon card for providing me the insight not only of Meyers, who was one of the few Native Americans on major league rosters at this time, but also of the catcher’s equipment during this era. What is going on with that Tony Lazzeri card, #113 referenced above? Why is he posing as a catcher?